Editor&apos;s note: For more years than we can remember, the Friday before Thanksgiving has meant that NPR&apos;s Susan Stamberg would try to sneak a notorious and, yes, weird family recipe into NPR&apos;s coverage. And 2015 is no exception. Here&apos;s Susan. I recently learned about a long ago and faraway Thanksgiving in Kabul, Afghanistan. In 2011, at the height of the military surge, hundreds of Americans — soldiers and civilians — were coming into the country. Ann Exline Starr of the U.S. Agency for International Development, was on a team trying to suss out fraud, waste and abuse in government contracts. She says security at the embassy compound was tight. "You had to go under the road to get to the USAID offices, and we were actually in a bunker," Exline Starr says. Pretty grim. For Thanksgiving, she organized a potluck dinner in her apartment. With all the Americans in Kabul, Exline Starr says, she was lucky to be in an apartment. She had previously lived in a "hooch" — a containerized housing unit. It&apos;s literally a tin container — 10-by-15 — with a bed, a desk, a chair. "We were thinking about starting a magazine like Better Hooches and Gardens or something," she jokes. It was bad enough to be away from home, in a war zone, in a hooch. But at Thanksgiving? "You know, Thanksgiving is such a family holiday that we tried to make it fun," Exline Starr recalls. So she invited about 100 people for dinner. Jonathan Terra was among those who attended. He was in Kabul doing a media campaign about USAID for Afghan radio and television. He hadn&apos;t been there long and didn&apos;t know that many people — his family was far away. "Suddenly, these people you didn&apos;t know very well became your family for a day," he says. And your potluck holiday dinner was as close to the real thing as you could get it. Local markets were too dangerous to visit, so you&apos;d nab carrots and celery from the embassy dining room. 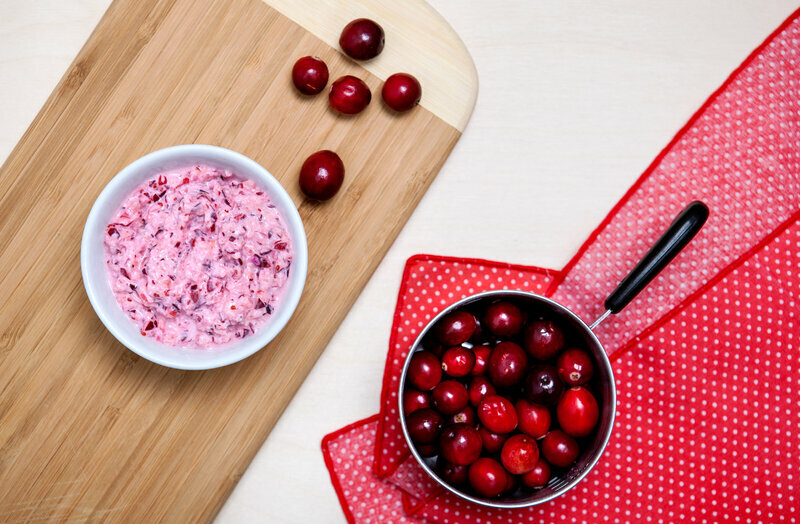 Other stuff, too — cranberry relish, for instance. That came courtesy of Andrew Hyde. "Of course, for many years I&apos;ve heard about a certain cranberry relish recipe that I thought about," Hyde says. "Wait a minute," I ask. "You thought about Mama Stamberg&apos;s cranberry relish in Kabul, Afghanistan?" "I&apos;m not in an apartment — I can&apos;t bake anything. I&apos;m not that great a cook." But Mama Stamberg&apos;s cranberry relish, he says, "could save the day." Not everyone was equally enthused. "When I mentioned it to somebody, they said, &apos;Is that all you&apos;re going to offer?&apos; " Hyde recalls. But, Jonathan Terra vouches, the end result was "very good." Finding the ingredients necessary was somewhat tricky, Hyde says. Sugar was readily available, as were onions. But the three-quarter cups of sour cream? Not so easy — though eventually he found some in a small convenience store on the embassy compound. The hardest part, Hyde says, was the 2 cups of raw cranberry the recipe calls for. The dining room, he says, "actually had a horseradish sauce. So I took a little plastic container and filled up. It wasn&apos;t the way I know Mama Stamberg would appreciate, but it worked." He couldn&apos;t freeze it (the recipe calls for that). So it was served mushy-soupy. And the color was a bit off — not the traditional bright pink (OK, Pepto Bismol pink, as some cruels have called it.) The Kabul Mama Stamberg&apos;s was more bubble gum pink. But they liked it! In Afghanistan, Jonathan Terra says, it was the taste of home. "Because cranberries are difficult to get abroad, when you have them, it&apos;s extra special," he says. "This is the kind of thing that brings you back to being back home with your family. It&apos;s the sight and smell of cranberries. It just doesn&apos;t exist anywhere else — cranberry is something that makes us think of being home." This year, in the U.S. or Afghanistan or wherever the holiday finds you, have a great Thanksgiving.